The mission of Children’s Village of Washington County, Inc., : A Crossroad to Safety is to provide quality life-safety education to all second grade students within Washington County, Maryland, and to serve as a central facility for the dissemination of injury and crime prevention education to the citizens of Washington County. Governed by a Board of Directors, made up of concerned citizens of Washington County from the business and education communities and from law enforcement and first responders, Children’s Village is able to remain current with the risks inherent in today’s society. They are charged with keeping the facility in good repair and the curriculum up to date. They also help to raise the funds to support this important program, which addresses the issue that accidental injury is the greatest cause of death and permanent disability to children under the age of 14. The program depends on active partnerships with the business community, civic organizations, the local public school system, local governments, fire and rescue companies, police departments, hospital, health department, Safe Kids, etc. The campus includes a classroom/office building, a hands-on skills activity building, a Power of Fire Exhibit Building (an actual burned house), a garage for the mini-cars and various small replica community buildings. The streets on the campus offer active traffic signals, crosswalk signals, bike safety lane and a course for the mini-cars. 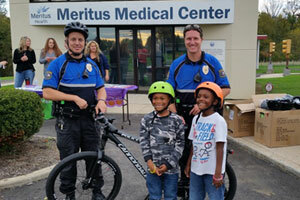 Hagerstown Police Department emphasizes the use of bicycle helmets in front of a mini-building sponsored by the local medical center. Visiting dignitaries from the central office of the school system. 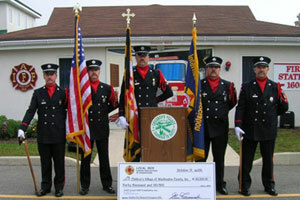 Honor Guard from the Local 1605 Career Firefighters of Hagerstown, a major donor to the program.